As feared as abominations are, even worse things dwell in the Kel'thuzad's citadel. For the record, that quote is transcribed word for word from my calendar. Naxxramas' is ruled by not just any Kel'thuzard, but the Kel'thuzad. I guess he had a phase where he decided that all Scourge leaders needed to follow The Lich King's example and have an article in front of their name. Grobbulus was created as a prototype for a new type of flesh giant. It was full of plague slime and had a giant syringe for a hand which it would use to infect people with. Said plague would eventually cause the subject to explode, damaging the subject and everyone around them. Clearly, the winning strategy against this type of foe would be to cluster as tightly together as possible. 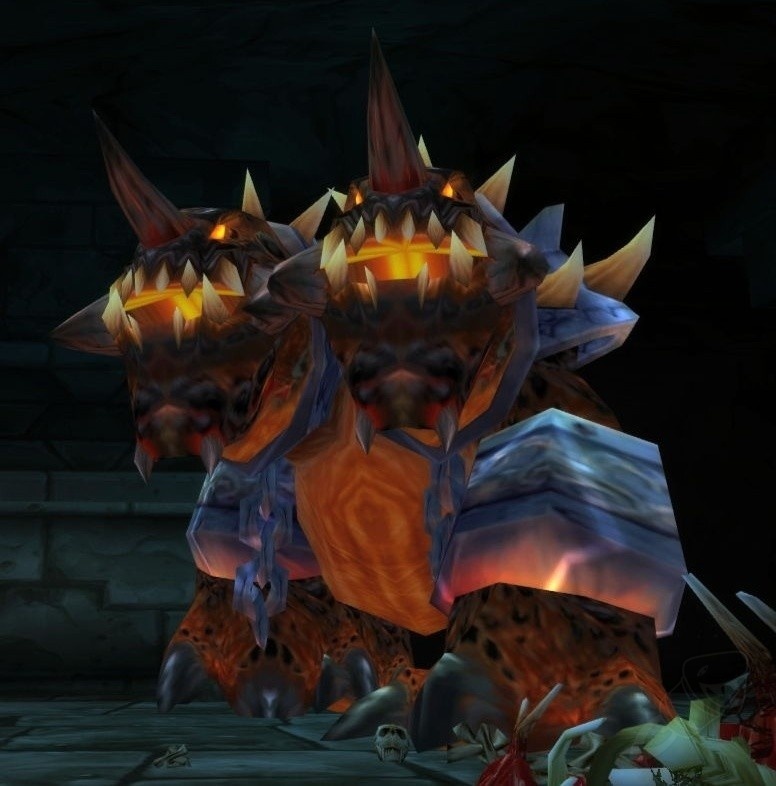 Grobbulus was destroyed due to the joint efforts of the Argent Dawn and Scarlet Crusade. It was later reanimated, however, and destroyed by adventurers once again in Northrend. It has likely since been resembled and now plays Hearthstone to pass the time, waiting for the day when Naxxramas will return to strike fear into the hearts of the enemies of the Scourge. Viscous Fallout was once a peaceful water elemental who lived in the water systems of Gnomeregan. However, the radiation unleashed within the city by Sicco Thermaplugg, led to the elemental's corruption and transformation into a radioactive toxic horror. Drops the Hydrocane, which is a really cool staff that lets you breath underwater indefinitely. Kind of useful if you're not a warlock. No relation to a certain video game franchise. Destroyed by adventurers. Hakkar the Soulflayer was the blood god of the Gurubashi trolls. In ancient times, his priesthood, the Atal'ai, sought to summon him into the world from the city of Zul'Gurub. The other trolls of the Gurubashi Empire thought this was a terrible idea, and drove the Atal'ai into exile. The exiled priests would eventually make a new home for themselves in the Swamps of Sorrow, where they constructed a new temple for their god, the Temple of Atal'hakkar. Their renewed efforts to summon their god were eventually stymied by the efforts of Eranikus and the Green Dragonflight. However, Eranikus and the dragons who remained within the temple would eventually succumb to the Soulflayer's corruption, eventually allowing his Atal'ai servants, under the leadership of Jammal'an the Prophet to return to their temple of carry out their dark designs. Jammal'an and his followers would not succeed in summoning Hakkar, however their efforts were not in vain. Another one of Hakkar's servants, Yeh'kinya, was able to make use of their efforts, tricking adventurers into summoning the Avatar of Hakkar and absorbing its essence into a special egg. Yeh'kinya then delivered the Egg of Hakkar to Zul'Gurub, where Hakkar's true summoning would take place. With the Egg, the remaining Atal'ai and their Hakkari followers, led by Jin'do, summoned Hakkar the Soulflayer from within the ruins of Zul'Gurub. High Priests of the other troll gods banded together to stop Hakkar's summoning, however, they would all ultimately fall under the sway of the Soulflayer, their power adding to his own. The Zandalari Tribe, knowing full well what Hakkar would be capable of, sent a group led by Molthor to Stranglethorn Vale in an effort to defeat the Soulflayer. Settling on Yojamba Island, the Zandalari recruited adventurers to help them defeat the blood god. Ultimately, the adventurers succeeded in raiding Zul'Gurub, freeing the bound spirits of the Gurubashi high priests, and defeating Hakkar and his followers. It seemed like Hakkar's plans would be delayed once again, however Hakkar was patient and willing to bide his time until another opportunity to enter the mortal world came about. The Cataclysm, however, likely ushered in his returned far sooner than anyone would have anticipated. Jin'do the Hexxer managed to bring himself back to life, and sought to summon Hakkar once again. His second attempt was stymied once again by efforts of adventurers and the Zandalari tribe, but the third time proved to be the charm. With their homeland damaged by the Cataclysm, and now slowly sinking into the sea, the Zanadalari tribe chose to establish new goals. While once their focused on preserving troll knowledge and culture, they now decided that the only way for their species to survive would be for the remaining troll tribes to unite, and form a new troll empire. Now supported by the Zandalari tribe, Jin'do brought forth Hakkar's spirit once more, although this time, rather than summon the Soulflayer, he instead bound the blood god in spirit chains, and proceeded to drain his power. In an effort to stop the rise of a new troll empire, adventurers stormed Zul'Gurub once again, this time to rescue Hakkar. After being freed from his bindings the Soulflayer promptly turned his wrath on Jin'do, and rewarded adventurers for their service by not killing them at this time. Hakkar the Soulflayer was likely the deadliest boss in WoW, as he unleashed a virtual plague in the game world. 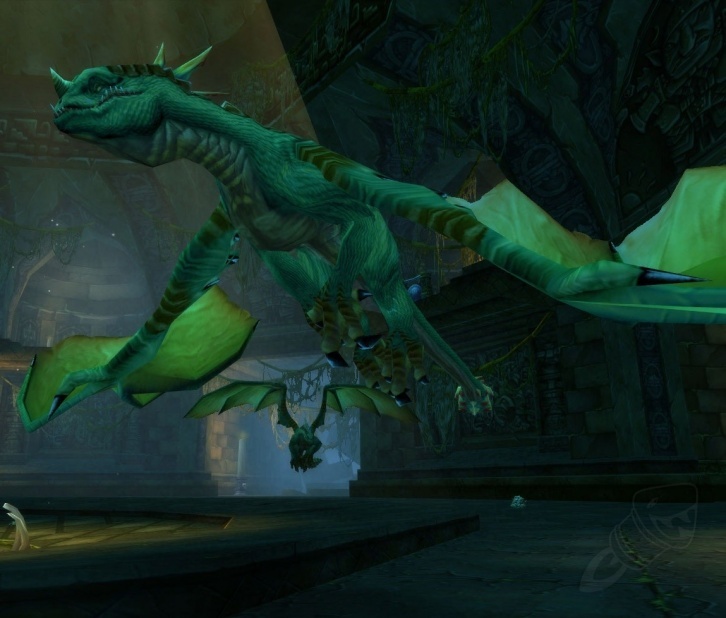 The Corrupted Blood Incident was the result of his Corrupted Blood power, a contagious damage over time debuff, escaping the confines of the Zul'Gurub raid and infecting characters outside of the instance, killing players en masse and providing an unexpected model for the spread of infectious disease. This event likely served to help inspire the Zombie Plague that was part of world event just prior to the release of Wrath of the Lich King. "This time, there will be no escape!" Azgalor was a Pit Lord and served as the Legion's field commander following the death of Mannoroth at the hands of Grom Hellscream. He led Archimonde's ground forces, consisting of both demons and the undead, against the forces gathered at Mount Hyjal. 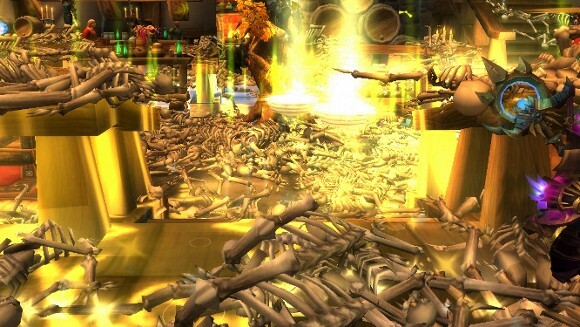 He was ultimately defeated by combined armies of the Alliance, Horde and Sentinels following the death of Archimonde. Azgalor's status is unknown, but he is likely still alive, merely banished back to the Twisting Nether rather than suffering a true death like his superiours, Archimonde and Mannoroth did. Adventurers traveled back in time to reenact the Battle of Mount Hyjal and fought him there. Rumour has it that his alternate past counterpart may appear in Warlords of Draenor due to the increasing presence of the Burning Legion there. Many try to obtain its hide for its legendary protection against heat as intense as lava. Many fail. The Beast was a powerful core hound who had captured by Nefarian's forces and subsequently retrained to serve them. He served his new draconic masters faithfully. The Beast, due to whatever experiments Nefarian performed on him, possessed a particularly strong hide, which was greatly sought after by adventuers, as the masfter craftsman, Malyfous Darkhammer's Fall catalogue contained many powerful items that required its Pristine Hide as a crafting reagent. However, it required a highly skilled skinner, with talents not normally heard of at that time, to successfully harvest The Beast's hide. The Beast was slain by adventurers, and its hide removed, likely with the aid of Finkle's Skinner. Once skinned, they discovered that they had inadvertently freed the gnomish adventurer and explorer, Finkle Einhorn from The Beast's stomach. As a reward for saving him, Finkle pointed adventurers in the direction of his friend, Malyfous. The Beast's son, the Son of the Beast, would eventually take his father's place in Blackrock Spire, sometime after the Ironmarch had claimed it as a base of operations. Pandemonius was a void lord who once served as a lieutenant to Dimensius the All-Devouring during his invasion of the ethereal homeworld of K'aresh. His actions during the invasion resulted in Pandemonius earning a host of impressive titles, including the Duke of Chaos, Eater of Nations, and Worldslayer. His service to Dimensius the All-Devouring ended when he was bound by Nexus-Prince Shaffar and forced to serve him. Pandemonius was killed by adventurers, and sent back to the Void from which he was spawned. A sample of his essence was delivered to Mamdy the “Ologist”. "You be dead soon enough!" Nalorakk was one of the strongest, and most fierce warriors of the Amani tribe. As a result, Hex Lord Malacrass chose him to be the vessel for the power of the troll bear god, Nalorakk, who's name he took following his empowering. During... Budd Nedreck's... uhg... treasure hunting expedition to Zul'Aman, Akil'zon captured and held the troll, Tanzar, captive, as Hex Lord Malacrass intended to sacrifice him and other captives as part of a dark ritual. Tanzar was rescued by speedy adventurers. Despite his seemingly low opinion of Budd Nedreck, Tanzar remained a member of his crew. As for Nalorakk, he was killed. That wasn't the end of Nalorakk though. He was somehow restored back to life as part of Amani's contribution to the Zanadalari Tribe's plans to create a new, united troll empire. However, he was soon killed once again by adventurers when they stormed Zul'Aman to put an end to the Zandalari Tribe's ambitions. Prince Thortheldrin was the leader of the ancient city of Eldre'Thalas, a Highbourne night elf and a member of the Shen'dralar. During the Burning Legion's first invasion of Azeroth in the War of the Ancients, the city had come under siege. While Thortheldrin and the city's defenders had succeeded in repelling the invaders, the demon's attacks and the earthquakes unleashed by the Sundering left much of the city in ruins. Furthermore, the destruction of the Well of Eternity left the Highbourne mages who lived in the city without a source of arcane power to draw on. In order to resolve the magic shortage his people were suffering from, Prince Tortheldrin captured the demon, Immol'thar, and used its powers to feed his people's thirst for magic, and grant them immortality. This system worked fine for several centuries, until Immol'thar's powers began to wane, and the bonds holding him began to weaken. Prince Tortheldrin's solution to both of those problems was to cull the population of Eldre'Thalas to a more sustainable level that could be supported by Immol'thar's waning power. Additionally, the population marked for culling would then sacrificed to strengthen the bonds holding Immol'thar. It was around this time that many of the Prince's followers began to question his sanity. However, the fates of those who questioned him led many to prefer to remain silent on the subject. Prince Thortheldrin's rule continued for many more millennia. He was quite welcoming to many of the explorers who ventured into Eldre'thalas, now known to the rest of the world as Dire Maul. Unable to leave the city of else risk losing his immortality, Thortheldrin was always interested in learning more about the world beyond the walls of his city, and was also willing to share some of his own considerable knowledge. However, anyone who attempted to steal the secrets of the Shen'dralar would be quick to earn his ire, and would likely end up dead. A party of adventurers, likely containing a warlock and a paladin, stormed the ruins of the city, destroyed the pylons binding Immol'thar, and then fought and killed the demon. After performing some strange warlock ritual to bind a dreadsteed, the party proceeded into the Anthenaeum where they encountered an enraged Prince Tortheldrin who tried to kill them. Prince Thortheldrin was killed by adventuerers, ending his ten thousand year reign. Prince Thortheldrin was succeeded by Mordent Evenshade as leader of the Shen'dralar. Mordent, tired of living in Dire Maul, sought to renew the ties between his people and the rest of the night elf population. Ending the long exile of the Highbourne, Mordent led his people to Darnassus, and allowing WoW players to play as night elf mages. Prince Thortheldrin was originally going to be involved in a questline to find Ashbringer, as he apparently knew its secret location, and was willing to share it with someone who brought him the head of Nefarian. However this questline was been dropped, and the Prince never shared his secrets. Ashbringer was later found in the hands of the Scarlet Highlord, Alexandros Mograine, however it had been corrupted and tainted by the betrayal of his son, Renault Mograine. Quagmirran was once one of the leaders of the bog giants who lived in Zangarmarsh. The naga, however, saw a use for him, and enslaved the mighty giant, torturing him until he submitted to their will. Now Quagmirran serves as an enforcer for the naga, helping them to subjugate others who dwell in the marshes. Too far gone to save, Quagmirran was killed by adventuerers. Mor Grayhoof was a tauren druid and member of the Veiled Blades mercenary company. The Veiled Blades had been hired to steal Lord Valthalak's spellbook, but ended up killing the draconoid warlock, and looting a cursed amulet from him. Taking the amulet and breaking it into several pieces summoned Lord Valthalak's angry spirit, who immediately summoned a horde of spectral assassins to kill the Veiled Blades. In poor shape after their fight with Lord Valthalak when he had been still alive, the party fled. Mor, however, slipped and fell, falling from Upper Blackrock Spire all the way into Lower Blackrock Spire and presumably, to his doom. While the party assumed that the fall killed him, it didn't. Mor survived, much to his regret, as he was captured by members of the Dark Horde and tortured by Warmaster Voone. In the middle of one of Voone's torture sessions, a spectral assassin arrived and killed Mor. Mor's spirit now haunts Voone's chambers, however it can only be drawn out through the use of a Brazier of Beckoning. Adventurers later summoned Mor's spirit, fought him, and retrieved the fragment of Lord Valthalak's amulet in his possession, freeing his spirit. Arcanist Doan was a member of the Scarlet Crusade and Keeper of the Scarlet Monestary's library. He previously served as a member of the Order of the Silver Hand, acting as an advisor on arcane matters. He was also a master of abjuration magic, and his Detonate spell was noted as being a powerful combination of abjuration and evocation magic in Ansirem Runeweave's The Schools of Arcane Magic: Abjuration. Doan was also present when Alexandros Mograine revealed the strange crystal that would one day empower the Ashbringer. As the only spellcaster there unable to use holy magic, he did nothing to help purify the crystal. He had a crush on High General Brigitte Abbendis, and would have likely joined her in Northrend as part of the Scarlet Onslaught had he been able to. He may have been the father of Abbendis' daughter, Lynnia, however it's unknown if High General Abbendis actually returned his affections or not. Doan was killed by adventurers when they stormed the Scarlet Monestary. He was succeeded by Flameweaver Koegler who was less concerned about preserving the contents of the Monastery's library and more concerned about destroying any evidence of the Scarlet Crusade's misdeed and failures, and also fire. ”You should have fled while you could, mortals! The fury of Blackrock courses through my veins! Vaelastrasz was a red dragon who had dedicated himself to ridding the world of Deathwing's son, Nefarian. To accomplish this, he infiltrated Blackrock Spire, at first disguising himself as a member of the Dark Horde, and then recruiting adventurers as they stormed through Hordemar city. By working together, Vaelastrasz and the adventurers were able venture further up Blackrock Spire, defeating Rend Blackhand, and gaining access to Blackwing Lair. However, Vaelastrasz, unwilling to wait for his adventurer allies to form a raid group, went on a head, and engaged Nefarian in combat alone. He lost to the black dragon, and in turn was corrupted by Nefarian's twisted magic. Nefarian gleefully turned the red dragon against his former allies, and greatly enjoyed the resulting battle. Unable to free Vaelastrasz from his corruption, the adventurers were forced to kill their former ally. Vaelastrasz apologized profusely to anyone he killed. Vaelastrasz had also been tasked with guarding the Red Dragonflight's shard of the Scepter of the Shifting Sands. After losing to Nefarian, the black dragon took the shard from him, intending to destroy it to see what would happen to the world as a result. Adventurers were able to reclaim the shard from Nefarian before he was able to succeed in doing so, however. Gurtogg Bloodboil was a massive fel dire orc, and proof that you can make creatures more powerful by giving them more adjectives. He was a member of the Bleeding Hollow clan, and a member of Illidan's Fel Horde. He was killed by adventurers when they stormed the Black Temple. In another time and place, his alternate past self emerged as one of the most powerful warriors of the newly corrupted Iron Horde, earning himself a position on the Hellfire High Council alongside Dia Darkwhisper and Jubei'thos. He hasn't been killed by adventurers... yet. Dreamscythe and Weaver were two of four young green dragons who traveled with Eranikus and Itharius to the Swamps of Sorrow to prevent Hakkar the Soulflayer from being summoned there by his exiled Atal'ai priests. After driving the trolls from their temple, they acted as its guardians to prevent the Atal'ai from returning. Unfortunately for them, they too succumbed to the corruption within the Emerald Dream, and were driven mad by its tainted power. Dreamscythe is the by far the most talkative of the four dragons. Keli'dan the Breaker was a fel orc warlock, and member of the Shadowmoon Clan, in the service of the Fel Horde and the Illidari. As one of the few remaining highly skilled warlocks left, Keli'dan served as Magtheridon's jailor, keeping the mighty pit lord contained while his blood and power were drained to produce ever more and more fel orcs. Keli'dan was killed when adventurers stormed the Blood Furnace in Hellfire Citadel to find out what was going on in there. His death greatly weakened Magetheridon's prison, threatening to release the pit lord on Outland once more. That, however, would be someone else's problem. Or, maybe the adventurer's own problem when they reached level 70 and wanted the rest of their Tier 4 gear. In an alternate past, Keli'dan the Breaker was one of many members of the Shadowmoon Clan who followed Ner'zuhl in embracing the power of the Dark Star and gaining mastery over the Void and learning shadow magic, and necromancy. He has the dubious honour of being one of the first call back cameos in Warlords of Draenor, being killed by the surviving members of the initial strike force sent to alternate past Draenor to stop the Iron Horde's invasion.